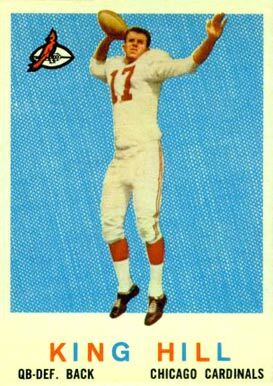 The Arizona Cardinals own the top selection in this year’s NFL college draft, and this is a 1959 Topps football card of the last player to be selected first overall by the Cardinal franchise, quarterback King Hill. He was chosen in 1958 with a “lottery bonus” pick, and halfback John David Crow was selected second overall, also by the Cards, who were based in Chicago at the time. Although he never was a star player, Hill played 11 seasons in the NFL with various teams, his longest stint ( 8 years) being with the Philadelphia Eagles. After retiring, he worked as an assistant coach and scout in Houston and New Orleans, was an avid golfer and aided in various charitable causes, including Ronald McDonald House, Big Brothers and Special Olympics. Hill passed away in 2012 at the age of 75.